Often known for her work in rainbow sofubi, artist Candie Bolton was brought to the fold to make some of her Japanese inspired art come to life in the Dunny. 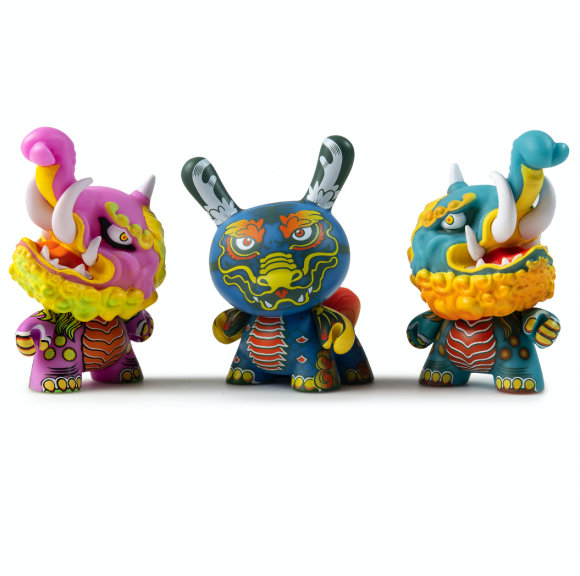 Creating two characters for the new Kidrobot x Clutter Kaiju Dunny Battle Mini Series here is a little more information on her designs. Dunny design name and background on the specific design. I’ve always been very fascinated by Japanese folklore and I enjoy finding ways to turn them into Kaiju. Baku is a creature based on a tapir (but often looks more like an elephant) and feeds off of people’s dreams. Kirin is kind of an Eastern unicorn, giraffe, dragon hybrid with mystical powers. Why did you choose that specific design? I’ve used these creatures as inspiration before ( Legendary Beasts Gacha set produced by Toy Art Gallery) and honestly I just wanted to revisit these characters because I like them so much! I was trying to find a unique way to incorporate Baku’s trunk and horn and thought it would be cool to make them the Dunny ears when it’s turned to the side. For Kirin I was looking at 4-legged kaiju designs for inspiration and based some of her design off of Dodongo from Ultraman. The default colorways were inspired by ancient Baku and Kirin sculptures found at shrines in Japan, while the alternate colorway for Baku is loosely based on the baku character from a certain popular Yo-kai franchise. While they look pretty fierce, I imagine them both as being shy and easily startled. Baku might be more extroverted of the two since she is always hungry and looking for tasty dreams to devour. Baku and Kirin both live wherever they please because they are imperceivable by normal humans. Baku in particular is unique because you have to use your imagination a bit to see the Dunny ears. Yes, I have the sketch for Baku, but my Kirin design went immediately to vector without doing a preliminary sketch. I am a toy designer and artist who primarily designs and paints Sofubi toys, but I’ve been dabbling a bit more in the designer vinyl world lately thanks to Kidrobot. It was always my dream to be an artist thanks to my mom who used to entertain me by drawing bunnies and horses. It’s probably one of my earliest memories! I didn’t think there was any realistic possibility of me ever being an artist so instead I got a job doing graphic design and I worked in that field for 5 years. During my time working there I was posting my sketches on instagram and also began collecting toys. Shortly after that I was discovered through instagram and I had multiple companies asking for me to design toys for them, it all happened really fast. I’ve been working in this industry for close to 5 years now and I sincerely hope it’s something I can continue to do for the rest of my life. I just started working with Kidrobot last year, our first project together was a 3″ dunny design for the City Cryptids blind box series. One of the artists on board for the project happened to drop out last minute and Scott Tolleson asked if I had time for it. I seriously had to hustle to get the whole design and colorway finished in time, but it was totally worth it! I have more designs with Kidrobot coming out this year that I can’t wait to show everyone! Kidrobot has always been a very important brand for me. I’m pretty sure the very first designer toy I ever bought was a Labbit by Frank Kozik. I remember back when I was in high school I always wanted to go to the Kidrobot store in San Francisco and it used to be that cool store you would go to whenever you happened to be in the area. I wouldn’t always have the money to buy something, but just being there and looking at all the toys gave me a very special feeling that I’ll always remember fondly. I have absolutely terrible handwriting, most of the time I have to write in all caps so that people can read it. What’s interesting to you about “kaiju” or monsters and creatures? Technically Kaiju can be any type of strange creature, but it was recently explained to me by a colleague that Kaiju are people in suits, so the overall silhouette of the design should always reflect this. I don’t know why I had never thought of it in that way before, but I really like this interpretation! I think monsters used to exist, but humans killed them all. Now we’re the real monsters!